It is the sequel to end all sequels. Frankly, it is hard to imagine they were conceived together, yet Wong Kar-wai reportedly was already planning it while he was filming the masterful In the Mood for Love. They might sound radically different on paper, but the same longing and regret is present throughout Wong’s 2046 (trailer here), which screens as part of the Metrograph’s retrospective series Maggie Cheung: Center Stage. 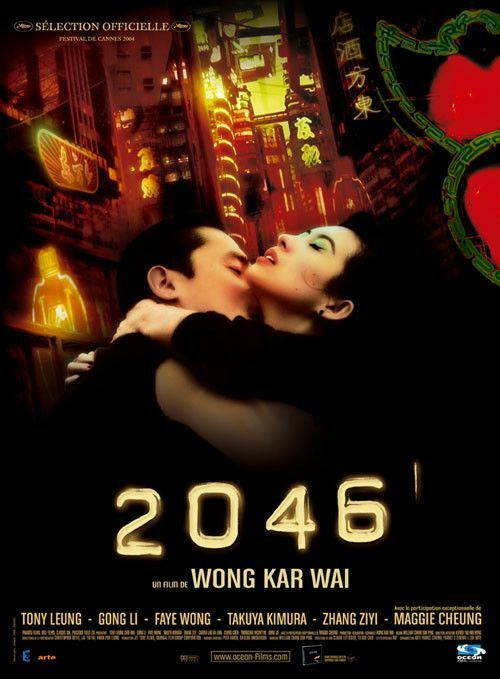 In one sense, 2046 might seem like a ringer in the Cheung series, because she only appears in brief flashback scenes, but her absence thoroughly dominates the film. Chow Mo-wan has returned from Singapore and Cambodia, picking up his literary and journalistic career as best he can. He never saw Cheung’s Su Li-zhen again, but her memory clearly haunts. In fact, his unresolved feelings make him incapable of maintaining a healthy relationship. Chow and Su used to meet in room #2046 of his residency hotel, so he requests the same number in Mr. Wang’s seedy, but assignation friendly Oriental Hotel (we are still in the mid-1960s here). However, he will settle for #2047. At first, #2046 is occupied by Lulu, a.k.a. Mimi, a callback from Wong’s Days of Being Wild. When she precipitously moves out (a not-so uncommon practice in Wang’s establishment), Bai Ling moves in. Chow definitely notices her and can often hear her entertaining through the thin walls (and vice versa). For a while, they carry on an ambiguous something, but he can never give her what she needs. He also assumes the role of a flirtatious Cyrano figure for Wang Jing-wen, the owner’s eldest daughter, who conducts a secret long distance love affair with a Japanese man her father disapproves of, due to national prejudice. Chow cannot even make things work with the second Su Li-zhen, a mysterious professional gambler who saves his skin in Singapore. Yet, Chow himself duly notes, the women who lose patience and exit his life often turn up in his fiction, particularly his science fiction stories, “2046” and “2047.” In this dystopia universe, 2046 is ambiguously both a time and a place of stasis, reachable by a train staffed with sexually compliant automatons (two of whom look like Wang Jing-wen and Lulu). Heartsick lovers often travel there to revisit past memories, but nobody ever came back, until Tak (a dead ringer for Wang’s Japanese lover) embarks on a return trip. When seen in close succession, Mood and 2046 pack a mean one-two combination punch. We definitely miss Cheung’s Su, but that is the whole point. We also fall hard for Bai Ling, Wang Jing-wen, and the second Su, yet we understand exactly why Chow is so emotionally hobbled. Even with his Errol Flynn mustache, “Little” Tony Leung Chiu Wai just radiates broken-hearted weariness. He has panache, but he cuts a rather gloomy, existential figure. However, it is Zhang Ziyi who really gives viewers a kick in the teeth as the radiate but heart-rending Bai Ling. Arguably, Faye Wong covers an even greater spectrum as the more upbeat Wang Jing-wen and the exquisitely tragic gynoid. Carina Lau makes the most of her diva turn as Lulu, but Gong Li is an outright showstopper as the Singapore Su. Nobody else could wring so much intrigue and dark romance out of such limited screen time. Production on 2046 was inconveniently interrupted by the SARS outbreak, but you would not know it from the finished film. It is seductively sad in a way that flows naturally from Mood, even during its flights of fantastical speculation. Without question, it features some of the best screen thesps of our time, working with one of the most distinctive international auteurs and accomplished cinematographers (Christopher Doyle, with an assist from the skilled Kwan Pung-leung), all of whom are working at the peaks of their creative powers. Very highly recommended, 2046 screens twice today (12/18) at the Metrograph, as part of Maggie Cheung: Center Stage.